After some custom ROM tests I come back to the official Samsung ROM; the latest ROM that Samsung recently released for the "old" Note 2 phablet phone. To reinstall the official ROM I can't use neither the OTA Upgrade nor the Kies Upgrade. The problem was the phone wasn't recognized by Samsung service as the official one, and in any case the Android version was already the latest one. So I installed the official 4.1.2 to try to use one of the official methods, and for this I installed mobile ODIN on my phone. 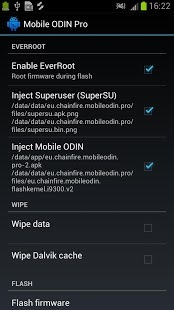 If you decide, in odin, not to root the phone and install mobile odin with the custom rom, the process also reset the "custom rom counter" to erase any trace of phone change. To prevent any possible bug I also decide to make a full reset of data and cache memories. If all worked well you should have a phone provisioned with the original Samsung ROM. Since I had chosen to install the 4.1.2 ROM, after the phone boot and basic configuration, I tried to make an OTA update ("You already have the latest version") and a Kies Update ("You cannot use Kies to update your phone"). So... even after all of this, nothing changed. If you have a Windows computer it's simple because you can use the "real" odin program, but, if like me, you just have a Mac or a Linux computer, you must use Heimdall to manually install your ROM. First of all you need to download the official Samsung ROM you want to install on your phone, and here google should help you pointing to the right file (Note 2 ROM). Then you have to connect the Phone via USB to a computer with Heimdall installed and the Samsung drivers to recognize your phone, and reboot it in the Odin Mode (Volume Down + Home + Power buttons pressed at the same time). After a while, and if all worked well, your telephone should reset in your brand new system. It's important to make a full rom installation (with all the partitions I listed in my command), in a different way your telephone boot but It detects you have installed a custom ROM (due to missing Knox requirements... that means you must install it on your phone :(). And more, without a full installation the wireless does not correctly work. Take care, all operations should be run as root user (with sudo prepend to any command, or changing user for root with sudo su command). I can say that this new ROM seems more stable than the customs I tested, and, even if is not "optimized" in term of memory and/or processor usage, I have no memory problem.